Trove, Skillet Regrade, Central Bar + Restaurant and other hot spots roll out new offerings for the new year. Here’s what’s new on the happy-hour circuit as we roll into the new year. Rachel Yang’s bar Quoin (attached to Revel) will be closed, but fans can check out her expanded happy hour at her Capitol Hill noodle house. The special is a Hite beer, a soju shot and a few dumplings to nibble on. All for $5. But how can you come here and not devour her renowned noodles? 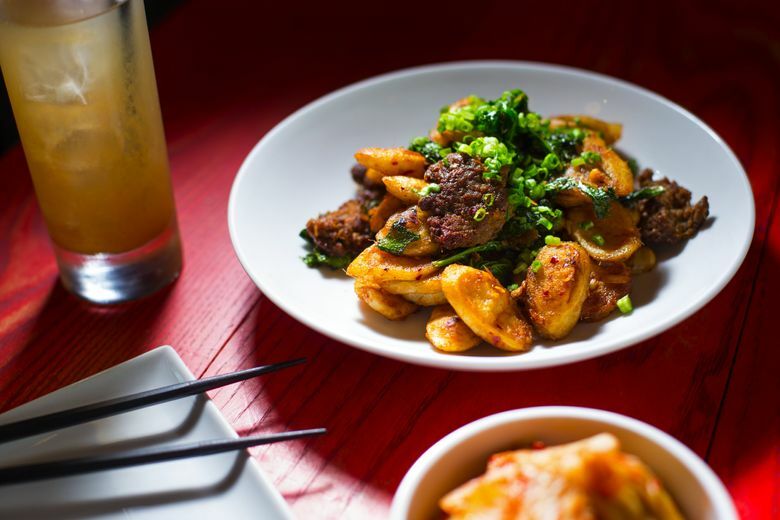 They’re $3 off during happy hour — from her signature rice cakes with lamb to a slick noodle with smoked brisket and Chinese broccoli. Happy hour 4-6 p.m. daily and again 9-10 p.m. Sunday-Thursday and 9-11 p.m. Friday and Saturday; 500 E. Pike St., Seattle; 206-457-4622 or relayrestaurantgroup.com. This Leschi spot from the team behind Barrio and all those Purple Cafe and Wine Bars now does Old-Fashioneds and other cocktails for $8. Try its fancied-up duck poutine, rich with white cheddar cheese and cut with gremolata, one of the better takes on the popular bar snack of 2017. Happy hour 3-6 p.m. weekday; 120 Lakeside Ave., Seattle; 206-707-9730 or meetthemooncafe.com. Amazon workers have about a zillion dining choices around their South Lake Union campus, so bars and restaurants are pulling out the sandwich boards to hawk specials. Skillet aims to get you in and out for less than $10. There are $2-$4 snacks, including cheddar bacon hush puppies ($3), garlic fries ($3) and a cheeseburger slider with signature bacon jam ($4). Wash it down with a $2 tallboy. Happy hour 3-7 p.m. daily. Amazon Building Doppler, 2050 Sixth Ave., Seattle; 206-512-2002 or skilletfood.com/restaurant/regrade. The owners of 520 Bar & Grill in Old Bellevue have expanded with this sleek, dark space in Lincoln Square. There are discounts on appetizers and shared plates, including crab-stuffed mushroom ($8), calamari ($9) and grilled steak bites with chimichurri sauce ($12). Happy hour 3-6 p.m. daily and again from 10 to about 11 p.m. on Tuesday and Wednesday; on Thursday from 10 p.m. to about midnight and on Friday and Saturday 10 p.m.-2 a.m.; 10475 N.E. Sixth St. Bellevue; 425- 578-7878 or centralbar.com. Unlike the rest of Belltown, this cocktail bar does happy hour on Friday and Saturday nights when the neighborhood is already in party-hardy mode. All specialty cocktails and small plates from lamb meatballs to grilled octopus are $2 off. The DJ spins soul and funk every Friday and Saturday, starting at 10 p.m. Happy hour daily 4-7 p.m. and 10 p.m.-1 a.m.; 2137 Second Ave., Seattle; 206-485-7385 or cursedoakbar.com. This ambitious craft-cocktail bar is still trying to get traction in West Seattle. We’ll see if the bar hoppers go for this: an additional late-night happy hour Monday-Thursday with $5 cocktails and many nibbles $6 or less, such as the scotch candied bacon and the braised pork slider. For larger groups, the half-off wine bottles ($15) are a better deal than cocktails. Happy hour 4-6 p.m. on weekdays and all day Sunday and again 9:30 p.m.-midnight Monday-Thursday; 4717 42nd Ave. S.W., Seattle; 206-900-0400 or alchemyseattle.com.